Types of brain injuries frequently encountered in premature neonates. Premature infants are prone to a variety of brain injuries. (A) A cross section of a healthy brain shows areas that are associated with injuries of prematurity. (B) The most common injury is noncystic PVL, which presents as a diffuse cerebral white-matter injury (orange) accompanied by microscopic focal necrotic lesions. (C) Cystic PVL is a more severe disease that, in addition to diffuse white-matter injury, presents with macroscopic necrotic lesions. (D) IVH, which occurs with much less frequency than PVL in premature infants, is characterized by bleeding (red) into the ventricular system of the brain. 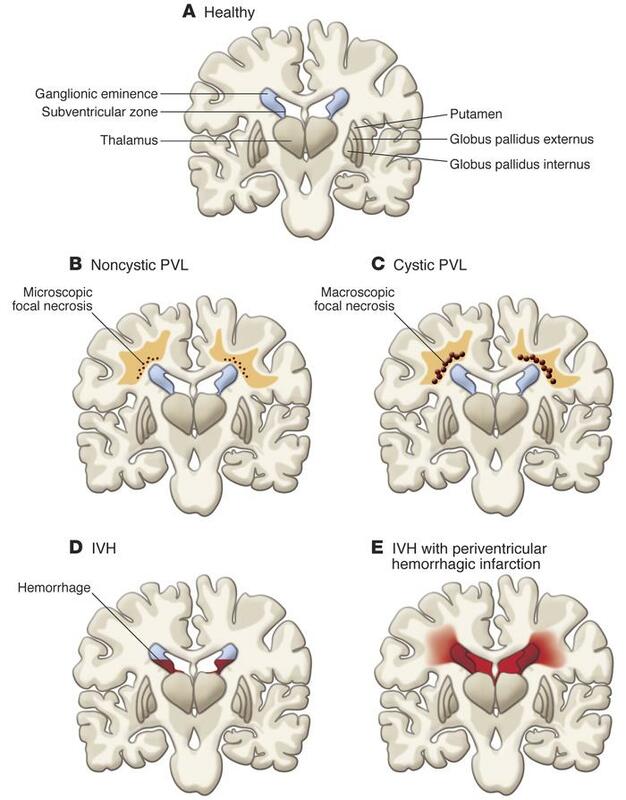 (E) The most extreme cases of IVH are associated with periventricular hemorrhagic infarction into the white matter.